On Sunday, Android Central published an article in which the publication shared an image of its Pixel 2 XL review unit. In use for about a week, the unit’s display is already showing signs of OLED burn-in. Multiple publications, including 9to5Google and The Verge, have since checked their review units to find that the displays on their phones have started to show signs of burn-in as well. For what it’s worth, MobileSyrup‘s Pixel 2 XL review unit appears unaffected for the time being. Screen burn-in occurs when an OLED screen displays the same images for an extended period of time. On a smartphone, user interface elements — like the navigation buttons on Android — are typically the first to cause a ‘ghost’ image to appear even after the user switches their screen to display something else. That some Pixel 2 XL displays are already showing signs of burn-in is worrisome. In most cases, it takes take months and sometimes even years before an OLED display shows burn-in symptoms, not mere days. After Android Central‘s Alex Dobie tweeted out the image of his Pixel 2 XL’s display (seen above), a number of other new Pixel 2 XL users responded, saying that they’re seeing the same issue. Android Central points out the issue could be related to something called image retention, which, thankfully, is not permanent. However, by most accounts, it does appear the issue is related to burn-in. In a statement issued to Android Central and several other publications, Google has acknowledged the issue and says it is investigating it. 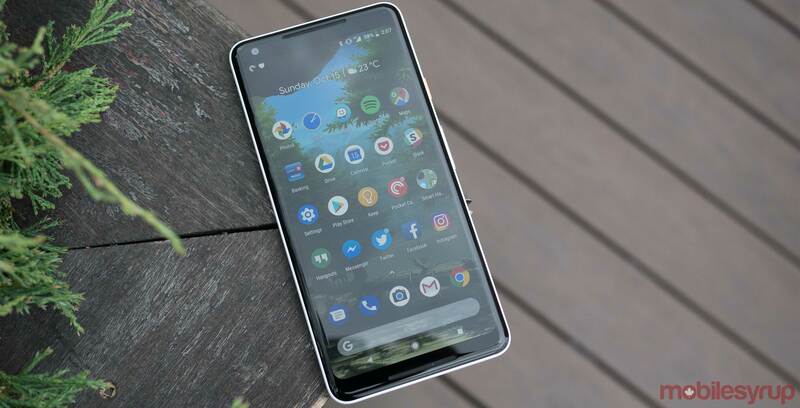 “The Pixel 2 XL screen has been designed with an advanced POLED technology, including QHD+ resolution, wide color gamut and high contrast ratio for natural and beautiful colors and renderings. We put all our products through extensive quality testing before launch and in the manufacturing of every unit. We are actively investigating this report,” said a Google spokesperson. We’ll keep track of this issue as it develops and publish follow-up articles as new information becomes available. Update 10/24/17: Various outlets with early Pixel 2 XL review units are reporting the device’s display suffers from screen burn-in issues. While our review Pixel 2 XL initially didn’t suffer from problems, screen burn-in eventually appeared. We’re unsure how widespread this issue is and if it gets worse with time. Below is an image of the issue.